MCD BETTER, italian company with many years' manufacturing experience, produces industrial tools to work light alloy (aluminium, PVC) and iron profiles. 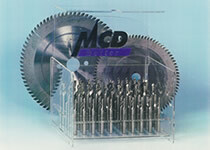 MCD BETTER (Milling-Cutting-Drilling Better) is guarantee of quality, reliability and professional treatment. The high quality technology and the skilled staff make possible to produce high precision industrial tools. These properties and low prices let the company have a good place in the national and international market.